This is the 2nd book in the Harriet Hamster series. Harriet is no longer invincible, but she is as brave and strong as ever! 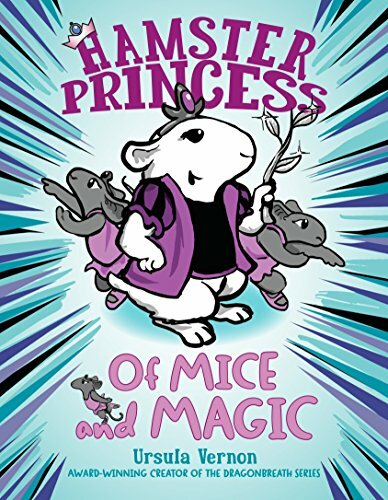 This book takes Harriet on an adventure to save the Twelve Dancing Princesses. They have been cursed and are unable to stop dancing! Harriet knows she has the experience to save them, and she doesn't hesitate! The story tells the amusing and exciting tale of her adventure. She meets many interesting characters on her journey. The reader will stay involved in the story from beginning to end! Can she break the curse and save the Dancing Princesses? I am a big fan of the Dragonbreath series, so I was really excited to read this book! It looked like it was geared more for girls and many would think the Dragonbreath series is for boys. I like them both! I thought this book was extremely amusing! I enjoyed the character of Harriet. She is funny, brave and has a great attitude! This book has wonderful illustrations that help keep the reader interested. I would recommend it for anyone who likes books like Dragonbreath or Babymouse. This book is perfect for readers of all ages.